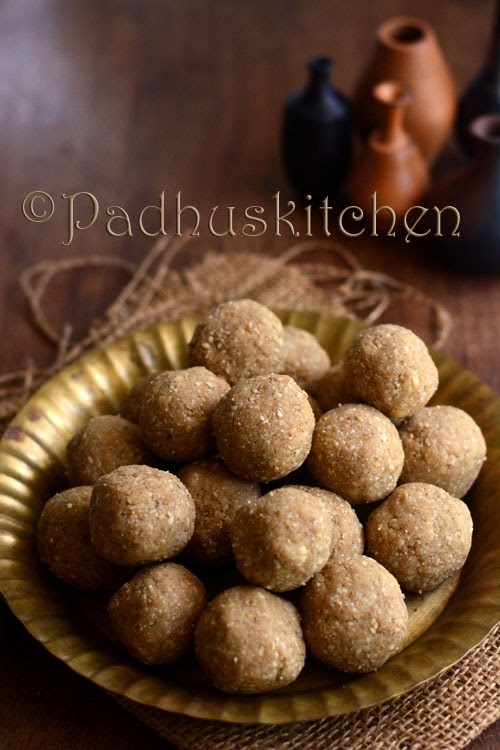 Peanut sesame seed coconut laddu is very nutritious, healthy and easy to prepare. You just need 3 main ingredients for making this laddu. I love snacking on these healthy guilt free laddus. As these laddus contain peanuts, jaggery and sesame seeds, they are rich in protein and iron. These guilt free laddus can be had as a snack, can be given to children as after school snacks or can be packed in their snack boxes. I often make and stock these kinds of healthy laddus at home to snack in between meals. I adapted the recipe from here. What I loved is the addition of ganthoda powder. Ganthoda/Peppermaul powder is made from the root of long pepper. It is said to help joint pains and gastric troubles. Today we will learn how to make nutritious peanut laddu with jaggery, sesame seeds (til) and dry coconut following this easy recipe with step wise pictures. Dry roast peanuts on medium heat stirring continuously till it splutters and and is nicely roasted. Once it cools, rub the peanuts and remove the skin. Grind peanuts and sesame seeds separately until slightly coarse. In a bowl, mix together powdered sesame seeds and powdered ground nut/peanut powder. Add dry coconut powder, dry ginger powder and ganthola powder. Mix everything well. Heat 2-3 tbsp of water and dissolve jaggery in it. Filter it to remove any impurities. Now add ghee to the filtered jaggery and heat it again. Boil until it bubbles and starts thickening. Add the jaggery syrup to the peanut, coconut and sesame seed mix. Mix well until there is no dry flour. Once the mixture is warm, make even sized smooth balls from the mixture. After it cools completely, store it in an airtight container. It stays at room temperature for 1 month and for a longer period, if refrigerated. Thanks Padhu for a wonderful healthy snack recepie.this is an absolute healthy snack.going to try this for my granddaughter.i am a great of you.congratayou are doing an amazing job. please let me know why you used ganthola powder ? It is optional. I have used as it is good for joint health. one more doubt. is kandathippili and ganthoda (peepramul) same? Hi Padhi! Very healthy and tasty recipes �� how to make dry coconut? You can it ready made or use kopra coconut. Grate the kopra and use it.